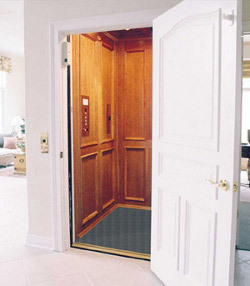 Looking for an elevator or vertical platform lift for your Billings home or office? G & J Enterprises has access to elevators and vertical platform lifts from several manufacturers. Our favorite brand is National Wheel-O-Vator. Looking for an elevator or vertical platform lift for your Billings home or office? G & J Enterprises has access to elevators and vertical platform lifts from several manufacturers. Our favorite, and the brand we usually recommend is National Wheel-O-Vator. National Wheel-O-Vator is a division of ThyssenKrupp Access and is the premier manufacturer of elevators and vertical platform lifts. Based in Roanok, Il. they are world renowned for their quality and dependability. Whether you are looking for improved access in and indoor or outdoor application, vertical platforms lifts provide a safe and economical way to overcome architectural barriers. Available in a variety of models, we can install and maintain vertical platform lifts ranging all the way up to 195″ (thas over 16 feet!) of maximum lift in your residential or commercial application in Billings, MT. So no matter if you need to get onto the deck or up several stories, we can get you there with a quality vertical platform lift from ThyssenKrupp. – Due to the wide range of products and options available and the variability of each unique installation, please contact us for an assessment of your needs and for more information and pricing. Vertical platform lifts and elevators offer a wide range of models, configurations, and options to meet virtually any handicap access and architectural barrier. They can be installed either indoors or outdoors and models are available to meet both residential and commercial codes. All models of vertical platform wheelchair lifts include a main control panel on the side guard. This panel consists of a constant pressure swithch as well as an emergency stop button. The above list merely highlights some of the many options and features available. For complete details give one of our knowledgeable staff a call today to find out exactly what options are available for your vertical platform lift or elevator needs. Impaired mobility does not mean you can’t have access to your home or office. 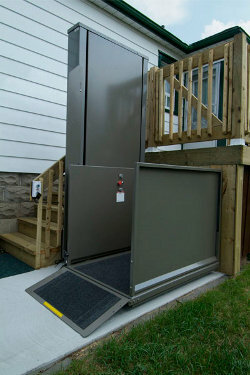 Call us to see just how easy and affordable improved access with a wheelchair lift can be. G & J Enterprises is your one stop solution for all of your vertical platform lift needs in Billings. Not only do we sell them, but we truly know the products inside and out. We offer a complete solution to your needs from providing information before the purchase to installation, warranty work, modifications, and repairs. Our technicians are fully certified and have years of experience installing and maintaining elevators and vertical platform lifts in both residential and commercial settings. Service is what we are all about. Before, during, and after the sale G & J Enterprises promises to deliver the best customer service available in Billings or anywhere. We are a family owned and operated business and always go the extra step to make certain that each and every customer is truly satisfied with both their products and their increased mobility and accessibility.